My dad wanted a blue comforter for his guest room and this fit his need. I think he wanted a deeper blue that was more "masculine," but I was buying it, so he's happy. It appears to be the right warmth for cool Bay Area nights that hover in the 50s. Comfortable and affordable, this down hypo-allergenic comforter is a great upgrade for your bedroom. 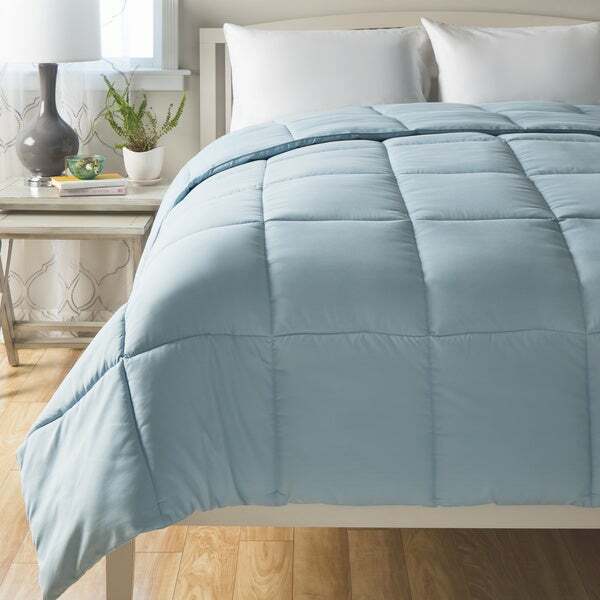 Available in multiple colors, this microfiber comforter is filled with hypoallergenic polyester and is perfect for all seasons. This down alternative blanket is available in multiple sizes and is machine washable for easy care. I purchased this comforter in light blue. I loved the color. It looks beautiful. I am very satisfied with this down alternative hypoallergenic comforter. This comforter is easy to care for. It has been washed multiple times and the fill stays evenly distributed and the color bright. Nice weight, not too heavy. Best comforter ever. Soft and feels great. Keeps you warm but doesn't go overboard by making you sweat. Very happy with this purchase. A sleigh bed isn't made to use with a bed skirt, so a large comforter is a must in order to conceal the boxspring. This oversized king is perfect over my queen mattress, as there's just enough overhang to tuck into the bed frame on the sides. The pale blue is a beautiful shade, the material is super soft, it's generously filled and has a good weight. I highly recommend. I love the softness of this comforter and the shade of sage is perfect; very subtle. I ordered king size for a high queen size bed. It covers very well and still allows the bedskirt to be seen. Very pleased with this purchase. Really nice oversized comforter. Light in weight, and washes like a dream. I have a giant dog, who thinks her place is on the bed with me for late night TV-watching, which means frequent machine washing and drying are needed. The color has remained true thru LOTS of washes, and the comforter is so light that it dries very quickly. NO PILLING, and NO WRINKLING! This is a 3 season comforter, and I love it's easy-care, wash and put back on the bed looking brand new every time. Very stain resistant, very tight weave. I love this comforter. I have 2 down comforters and one down alternative and I love all 3. This was nothing like any of them, but just a regular comforter with regular batting. It was heavy, and hot. As soon as I took it from the wrapping I knew it was just a comforter and not worth the hassle of trying to pack it back up and return. ( king size ) If you like regular heavy comforters, this would be a good choice, but in my opinion, it is marketed / advertised wrongly. The comforter actually measures 62X83 after fluffing and is advertised as 68X88. I bought this for a twin XL and thought it would work since it is slightly longer than a twin. Definitely won't work. So disappointing. Great price and I like the look and feel. Six inch discrepancy is ridiculous. Came apart first time I washed it! I wish it were a little bit bigger but beyond that, I find it warm and cozy. The silky texture gives you the sense of being in an expensive hotel or bed and breakfast. Very soft and plush. LOVE, love, love this comforter. It's warm, snuggly, and yet not heavy. My favorite new thing. Also love the color. I like the blanket. it makes my bedroom cheerful. I can always count on Overstock to have exactly what I need and the price I can afford. I love the fact the have blowout sales all the time. GREAT BUY FOR THE MONEY. TAKES WASHING WELL AND FEELS GREAT. GOOF FOR COMFORTER COVERS. Soft and comfy. Bought several. I was very pleased with the quality at such a reasonable price point. I will definitely order again. "Has anyone ever washed the comforter? " I've washed a nd dried mine twice. It seems to hold up well. "Is the Sage a true Sage or a lighter Minty color? The images depicts a lighter minty color.on my monitor." According to the manufacture, the color is consider true sage. The color is not mint, but it is a lighter shade of sage which I like. Blends well with other colors. To me. It is more sage than a minty color. Hope this helps. I have been well pleased with color and quality. Bham, AL. "Is the comforter light I weight? Can it be used I the summer?" "Is the burgundy more of a dull, dark red or a bright ruby red? The picture looks brighter than a true burgundy." Sorry I did not purchase it in that color. Another sorry! I went with the light blue - it looked exactly like the picture shown. "Is this product a duvet cover or an actual comforter?" This is an alternative comforter.